Tasslebury is a quiet, serene village nestling in the Cheshire hillsides. Its picture postcard cottages and rolling scenery attracts its fair share of tourists, and property prices are sky high. So when Derek Sideboard and his wife moved into number fifty-two Poplar Lane over fifteen years ago, they hoped the quaint, seventeenth century cottage would be the ideal place to spend their retirement. But just two months after the Sideboards had exchanged contracts, the Government designated their back garden an official nuclear test site. "It's terrible," Mr. Sideboard tells me. "Really awful - all that banging day and night. Sometimes it goes on for weeks at a time. We can't sleep at night and it frightens the dog." Today it's quiet, and Mr. Sideboard can make the most of the peace and solitude. It's late afternoon as I stand with him on the patio. Mr. Sideboard points down to the bottom of the garden., beyond the newly mown lawn and the neatly tended flower beds. "There, just behind the shed," he says. "That's where they do it. During their busy periods they detonate anything up to seven hundred megatons a day up there, just where my compost heap used to be. I've lodged an official complaint with the parish council, but they say there's nothing they can do." We can't sleep at night and it frightens the dog. I ask Mr. Sideboard whether he's worried that an ongoing series of nuclear tests in his back garden may be at all dangerous? "You might expect me to be a little nervous about it," says Sideboard. "But to be honest I've never given much thought to the dangers involved. "I suppose there is always the possibility of them hitting the house one day, but in the fifteen years I've been here they've never missed the compost heap once, so I can only conclude that they know what they're doing. "No, it's more of an inconvenience really. You don't realise until it happens to you just the kind of problems it can cause. For instance, my insurance premiums have gone through the roof, and my social life has suffered: nobody wants to visit you when you've got tactical nuclear weapons going off behind your shed every five minutes." I nod sympathetically and tell him I fully understand his predicament. "It has it's advantages," Sideboard is quick to point out. "We've never been burgled, and we don't get pestered by double glazing salesmen. I suppose they just see the sticky tape on the windows and decide to give us a miss. But these things are small consolation really. The wife and I are really run down by the whole affair. Life must indeed be difficult for Mr. Sideboard and his wife. Their rather exceptional circumstances must exact a toll. I ask if fallout is a problem. "Well we have the occasional tiff, but nothing too serious." "Oh that," Sideboard says. "Yes it is difficult, especially on wash days. We can't use the washing line now because everything gets covered in radioactive dust. "And it gets into the house as well. My wife is very fond of baking and she likes to get involved in local competitions. She recently entered a cream sponge in the church fete but it was disqualified and had to be disposed of by the army. Apparently there's not much call for confectionery that glows in the dark, which is a pity really. My wife recently baked our grandson a birthday cake which didn't need candles." Proximity to nuclear materials is notoriously dangerous. I ask Mr. Sideboard if his health has suffered. "Not spectacularly, no," he replies. "There's a lot of scaremongering about radioactive fallout. It's not really as dangerous as people think. My wife suffers more than I do: it brings her out in a rash." I nod sagely and ask if the fact that she appears to have two heads can be attributed to fallout. Mr. Sideboard looks at me with narrowed eyes and seems reluctant to answer. He mumbles something about surgical experiments in Geneva, but is unwilling to elaborate any further. Then all too soon it appears my interview is at an end, and I bid farewell to Mr. Sideboard and his unusual wife. The sun is setting as I leave the house. The warm, peaceful early evening is suddenly broken by a terrific 'kerthump'. 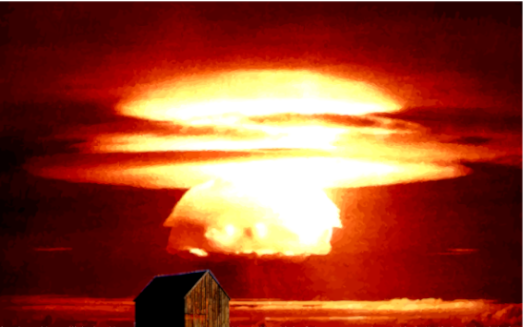 I stop the car and turn to see a mushroom cloud spouting over Mr. Sideboard's rooftop. It seems the testing has recommenced, and my sympathies go out to the Sideboards, who have no option but to endure this disturbance in order to secure Great Britain's place at the forefront of nuclear technology.